Back when I was a teenager, my aunt “informed” me that fat was bad, and sugar was ok because there were only 18 calories in a teaspoon. That little “revelation” may have caused nearly as much long-term damage to my health as my father’s cigarette smoking. It was shortly after that “revelation” that Senator McGovern decided that the government needed to take action on a topic about which he knew less than nothing, and use the recommendations of his personal quack (“doctor” Pritikin, whose website still pushes “hearthealthywholegrains” and claims that coconut oil causes heart disease because it’s full of saturated fat) as the new dietary guidelines for the nation. Interestingly, the Weight Watchers diet plan at that time was mostly low-carb, and stressed limiting anything with starch or sugar. Among other things, WW had figured out that starch gets converted by the body into sugar. I recall that there were special “WW” breads that were sliced extra-thin to fall under the carb limits. Back then, Weight Watchers was a very effective diet, and the WW ads touted their fairly impressive success rates. But as WW got sucked into the low-fat fad, they quit talking about their success rates (because they plummeted), and the meetings devolved into wailing and moaning sessions where people obsessed about food. I had great success with WW in the 1970’s, not so much when I went back in the 1990’s. It looks like things have gone full circle again, and the world seems to be waking up to the fact that sugar is basically toxic, at least in the amounts that the typical American consumes. The World Health Organization has now come forth with a recommendation that sugar should be no more than 10% of calories. That means keeping your sugar intake under 12 teaspoons a day (!!). I have a better idea, which I implemented for myself in 1999. My sugar guidelines (in addition to some other changes I made in my diet at the time) have resulted in the greatest improvements in my health I have ever experienced: DON’T EAT SUGAR. Don’t add it to anything, and don’t buy or eat anything that lists sugar in the first 4 ingredients (which was the WW guideline in the 1970’s). Also, avoid buying or eating anything with a nutrition label that tries to hide the sugar content by listing it under more than one name (this is also from 1970’s WW guidelines — they published a list of over a dozen names commonly used to disguise sugar). I have been ridiculed for my “n=1” experiments, but my “n=1” results are more valid than any of the nutritional “studies” I have read to date, simply because the purpose of my “n=1” experiments has always been to find what actually works, and not what is Politically Correct enough to attract more grant money from industries with vested interests in keeping people sick. 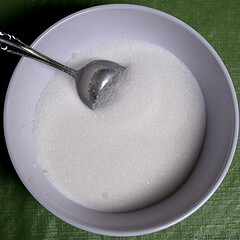 What the WHO guidelines still don’t recognize is that fructose is the worst part of sugar. Fructose got a pass from the nutrition “experts” back in the 1960’s because it didn’t (directly) raise blood sugar — and was recommended for diabetics for that reason. We now know that fructose in large quantities is a liver toxin that works in the same way as ethanol. It’s one of those things that the human body can tolerate in small quantities, but like alcohol, once you have overwhelmed the body’s ability to cope with it, your ability to tolerate it is severely (and possibly permanently) impaired. WHO still doesn’t recognize the other two most common dietary toxins: Frankenwheat and industrial seed/veggie oils.